Replacing your front door is often an area that's over looked as it can be costly, but if you get it right it will have a big impact on your homes kerb appeal, security and energy efficiency. 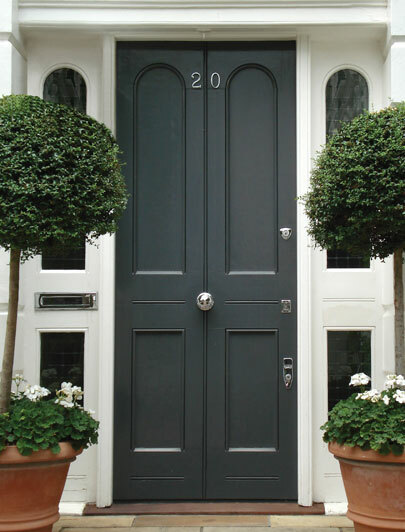 Here is our useful guide to help with choosing a new front door. The cost of a new front door can vary significantly from a cheap off the shelf PVCu to a bespoke solid hardwood front door. There are also other aspects to consider with the cost including whether you need to change the frame, if you want to change the area around your front door (such as introducing a glass panel to allow more light into your home), and how much you want to spend on the security features. Expect to pay from around £600 for a good quality PVCu front door and anything from £2,000 for a solid hardwood door. What security aspects do I need to consider? In terms of locks, most insurance companies now require that you have a 5 lever deadlock for your front door which must comply with BS3621. In addition to the lock, consider the quality of the door hinges, the strength of the glass you have used in and around the door area, and the also the material you have used. Look out for products with the Secured by Design accreditation to ensure they will give you the security that you need. If you like to be at the forefront of technology, you can access your front door by smartphone or finger print entry which will help with security measures, although you will expect to pay more. How can a new front door improve the energy efficiency of my home? You must consider the U-Value of your front door which means the higher the U-Value the less energy efficient it is. Building regulations place a maximum U-Value of 1.8W/m².K and you want to get this value down as low as possible for a high performing front door. If you want the most energy efficient front door, opt for a good quality composite panelled front door which is filled with either timber and/or a thermal foam core and will provide good insulation. Additionally a composite panelled door won't expand and contract with the change in temperature therefore you won't have a draught in the winter. What type of material should I choose for my new front door? 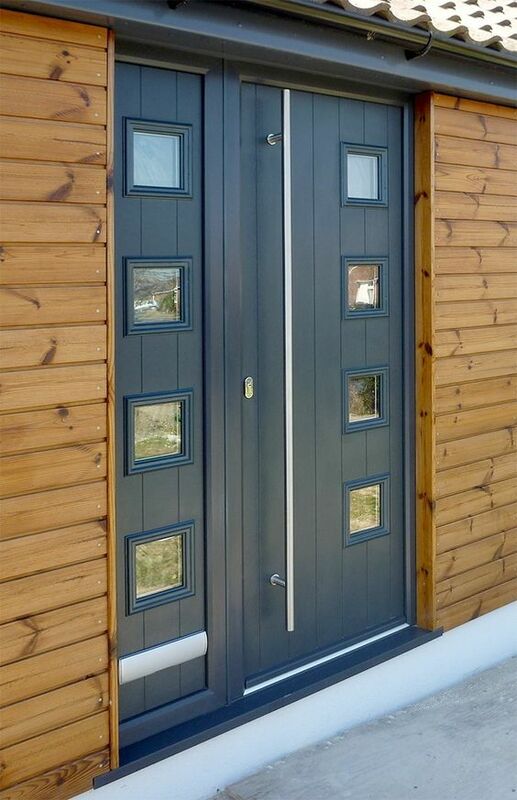 There is a huge range of materials available for your new front door from PVCu to solid hardwood. PVCu is the cheapest and is a thermally efficiency option, however it's not as popular as it once was due to it's often unattractive look. The most popular type of front door is a composite door. 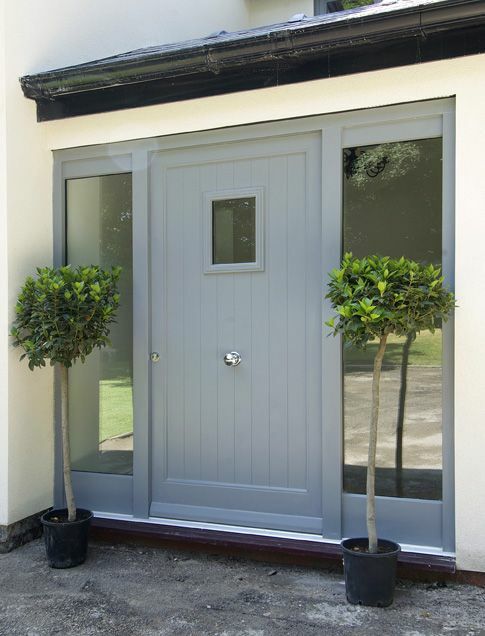 This is a thermally efficient front door which can be finished in a traditional or contemporary style and in a huge range of colours and finishes. The core of the door is made from either timber and/or a thermal foam core to help with the insulation, then wrapped in a layer of plastic for weatherproofing. A good quality composite front door will require no maintenance, be very secure and also energy efficient. Expect to pay around £1,000 for a good quality composite front door. Solid hardwood doors are perfect for a period property. The door will require maintenance over the years however will add a luxurious touch to your home. With a hardwood door, you have the option to repaint it and change the look of it over the years. Expect to pay anything from £2,000 upwards for a good quality hardwood door. Other options include off the shelf timber veneer, which are less energy efficient and won't look as inviting. Aluminium also works well for an ultra modern look but be aware that aluminium is not as thermally efficient as plastic or wood. What are the different styles of front door? There is a huge range of style from traditional period front doors to contemporary styles. Glass is a popular option in the front door and the look can be changed with the ironmongery and the colour. Large front doors are growing in popularity which give your entrance real presence. Whatever you decide, make sure you choose a style that compliments the look of your home.